You don't have to work in agriculture to be a shepherd. Whether it's at home, work, or with friends, God calls us to lead and protect the people in our lives. When we understand the roles God has called us to, we can live a life without regrets. On Sunday, March 17, 2019, Pastor Chad Gilligan shows us how to live out our role as shepherds. On Wednesday, March 13, 2019, Pastor Chad Gilligan continues 1st Wednesdays with an in-depth look at faith and Divine Healing, found in the book of Acts. Choose today to start building a life without regrets. When you understand your role, who you are, and who God called you to be, you will be able to look back on your life someday with a sense of satisfaction and accomplishment. On Sunday, March 10, 2019, Pastor Chad Gilligan gives us the tools to live past regrets and live a life of purpose, integrity, humility, and courage. What is your biggest regret? Is it a past relationship or decision? The thing you chose to do? Or the opportunity you missed? No one lives a life without regrets. Because no one is perfect. We all have a past, but it doesn't have to define our future. On Sunday, March 3, 2019, Pastor Chad Gilligan speaks on how to look to the future and live a life without regret. For many of us, we look back with great regret on the decisions and actions of our lives. What if we could look forward and determine how to live life without regret in the future? By examining the example of the Apostle Paul, we can take steps to live a life without regret and filled with purpose. 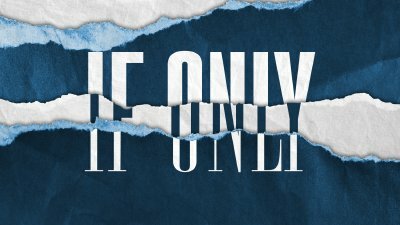 On Sunday, February 24, 2019, Pastor Chad Gilligan preaches on not letting an opportunity pass you by as he begins his new sermon series, If Only.